The last time we posted this Amazon deal, it sold out quickly. These Cloth Storage Cubes Bins are perfect for organizing shelves, closets, storing DVDs, and organizing baby nurseries. Hurry and get the MaidMAX Cloth Storage Cubes Bins, Set of 6 today for $23.99 only $10.19 when you use promo code QU29NQ4B at checkout from Amazon! Buy 2 for $20.18! There are different colors available but the coupon code only works on the beige or black color choices. Quickly see your choices here. Check out all of the Amazon deals here! How large is each storage cube? What can I store in it? Each cube measures 11 x 10.5 x 10.5 inches, which fits most cube organizers. Perfect for storing items ranging from child clothes, underwear, socks, bras, leggings, sweatshirts to even small records or albums at home, office and even nursery! Of course. Every bin comes with 2 handles for quick access of your stuff. This storage comes with a open design for easy access. If you really need to stack them to save room, we recommend you to place the cube which is full and filled with stuff that you don’t commonly use at the bottom. 3. Please do not touch the cubes with sticky or greasy hands. 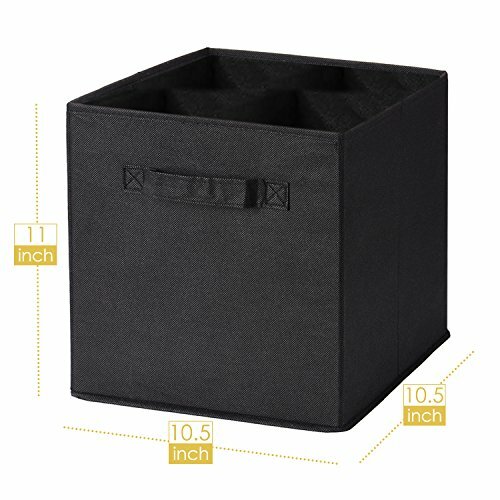 Buy the MaidMAX Cloth Storage Bin with Dual Handles for Home Closet Nursery Drawers Organizer, Foldable, Black, 10.5×10.5×11″, Set of 6 from Amazon.